Hey everyone! In these last couple of weeks before Fall ends I wanted to deck my nails out in some last-minute Summer shades including this slightly-trendy color. My Boyfriend Scales Walls by OPI is somewhere between a cool white and a very pale grey which I just think is so amazing. I know grey nails are a thing. I know white nails are a thing. But Greight? Whey? Whatever you want to call it, all I know is I am in love! Originally I grabbed this color because I was inspired by some of the trendy white nails I've seen here and there throughout the Summer. I've done white nails on my toes before and I always found it to make my skin look very tan, which can be a good or bad thing depending on your preference. Tan toes are Summery and cute but tan hands on me? Not so much. This is why this pale dove grey was so appealing: it presented the possibility of having the modern look of white nails without the harshness of a flat white, plus the cool undertones reduce the sallowness of my hand color. Baller. Here I wore a base of my current favorite OPI Nail Envy with 3 coats of OPI My Boyfriend Scales Walls combined with Essie Beyond Cozy on my ring fingers (previously swatched here) and Seche Vite Top Coat to give it a glossy finish. The polish application wasn't too bad but definitely had a bit of streakiness which is why it required 3 coats if applied in thin layers. Also, I noticed that the polish took a little longer to dry 100% than some of my other polishes. Otherwise, I am honestly a little obsessed with how clean and pretty my nails look with this color on and it serves as a nice transition into this last month of Summer! Readers, have you tried out white nail polish? Do you find the look to be fresh or too flat like whiteout? Let me know in the comments! The two colors make a perfect combination! I'm dying to find this particular OPI shade, but it's sold out pretty much everywhere I go!! >_< I love the idea of a white that isn't flat white, but isn't dull to the point of being grey. I NEED THIS!! I found a bottle at the beginning of the year on clearance, I love this polish! It's so chic being ever so slightly off-white. Princess Rule! is still one of my favorites of all time! I've been looking for a grey-white like this for a while- thanks! Pretty colors! I think that your polish application is pretty darned perfect! I never manage to stay just on my nails. I love this colour, they work so nicely together! 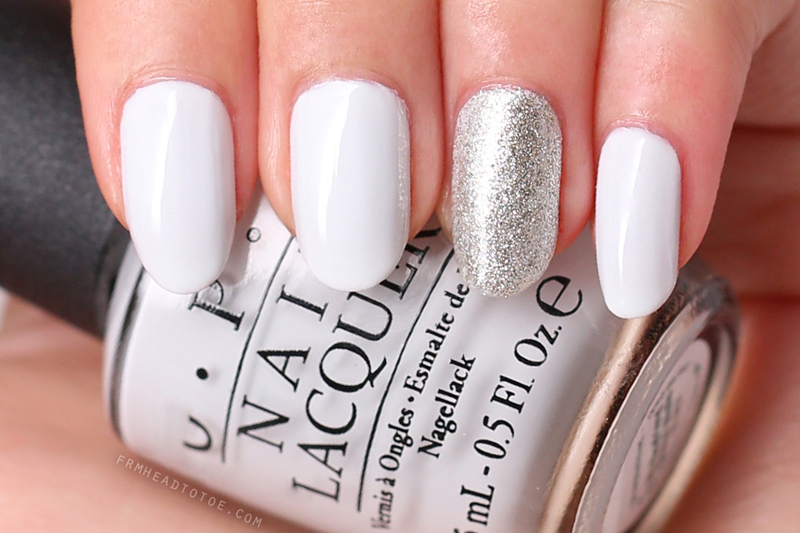 Love this shade, very chic and clean! I saw this on Holly Ann-Aeree's blog and was lucky enough to find it when I was in the states back in January. Absolutely looooove it!! So glad to see you like it too! Love it love it love it! Really inspiring and I'm going to seek that grey color! !